The Giant Panda is one of the world's most recognizable animals, thanks to its distinctive white face with large black eye-patches and black ears. Sadly however, fewer than 3,500 of these remarkable creatures survive today and as a result the Giant Panda is officially classified as "endangered". 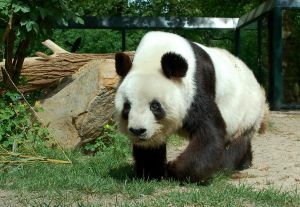 The Giant Panda is a member of the bear family, but unlike most bears they do not hibernate. They are primarily solitary animals and spend most of their adult life alone. The Giant Panda was originally a meat-eating carnivore, but adapted to its environment and now feeds on bamboo. Because its digestive system is still similar to that of a carnivore though, it is rather inefficient when processing plant food - for this reason an adult panda must eat 20 pounds of bamboo per day to get the nutrition it needs.